On Tuesday, the Montgomery County Council will try to clear up a bit of confusion over Maryland's decriminalization of marijuana. While the state has decriminalized the possession of small amounts of marijuana, that's not the case for the type of pipes used to smoke it. Under the new rules, adults in Maryland caught with less than 10 grams of pot will get a fine, with no jail time, court appearances, or criminal record. However, possession of drug paraphernalia is still a crime. That means that someone could get in more trouble for having a pot pipe than the pipe itself. 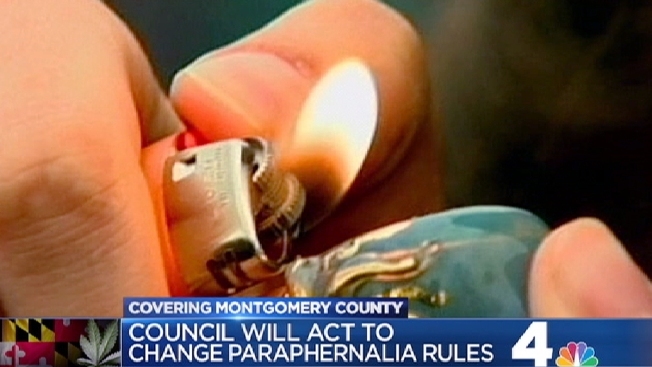 Some lawmakers in Montgomery County see that as a major disconnect, and on Tuesday, the council will take up a resolution to fix it. The resolution will call on the state's General Assembly to decriminalize possession of drug paraphernalia as well. Advocates say possession of small amounts of pot and drug paraphernalia should be among the county's lowest law enforcement priorities.